Dr Tilak completed Pain management training from the University Hospital Bimingham, to be awarded FFPMRCA (Fellow of Faculty of Pain Medicine of the Royal College of Anaesthetists). His pursuit for excellence took him to London, post his CCT. He trained at The Royal Free Hospital in London for a further 6 months in Pain management, and worked there as a Consultant in Pain management prior to moving to Midlands. He moved to Warwick hospital to develop multidisciplinary pain management service and is now the Lead of Pain management service at the South Warwickshire Foundation Trust. 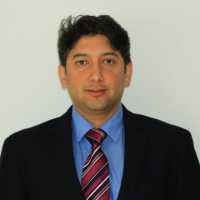 He is proficient in various aspects of complex pain management including interventions. He routinely does all type of pain injections under Xray and Ultrasound guidance. Consultant Anaesthetist and Lead Pain management service. Aims to develop patient centred management plan, as chronic pain is recognised as a long term condition. 2. Opioids in chronic pain.